Is it Time to Maintenance Your HVAC? NW mechanical knows the importance of properly running air conditioners, furnaces, and HVAC systems. With busy summer schedules, HVAC repairs are not something you want to deal with, especially when the Puget Sound area is starting to experience warmer weather. While it may not be your top priority, scheduling regular HVAC maintenance for cleaning and servicing is the soundest, most practical choice you can make. Improve Energy Efficiency: One of the first things a service professional will be able to determine by checking over your HVAC systems is whether or not it was installed properly in the first place. 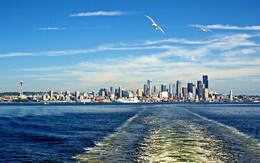 Many homes in the Seattle area have poorly installed systems that will need to be updated. Experts suggest improper equipment installation could decrease your home’s heating and cooling efficiency by 30% right off the bat. When you consider that the average American home spends about 2.7% of their income on energy bills, that’s good money! It is also recommended by Energystar.gov to have your air filters replaced at least a couple times per year to keep your systems running at full efficiency. Keep Home Safe and Clean: Financial and environmental reasons aside, there are some very real and potentially serious risks of not attending to your HVAC systems. Dirt, bacteria, and other foreign substance build-up from long periods of no maintenance can cause allergies and respiratory problems for people living in the home. There is also a chance of a fire breaking out from something as small as a malfunctioning electrical component that could be prevented by regular service maintenance by a professional. Don’t Wait Till It’s Too Late: At the end of the day, your air conditioning unit is the difference between living comfortably or being miserable in the heat. If you wait until there is an issue or a needed repair, you run the risk of delays for service or parts and increased expense. This is why our team at NW Mechanical strongly urges our customers to do annual maintenance. According to the U.S. Department of Energy, heating and air conditioning your home account for about 43% of your monthly utility bill. These are some great strategies for helping to keep those and other associated costs down while also helping to guarantee your system works by investing in regular maintenance and service. If you’re not sure where to start or just have questions, give our team a call today!